When Andy Warhol painted his Pete Rose Serial in 1985 he also produced a set of 50 lavender prints. As part of this process an additional 30 test prints were created. One of those test prints is currently up for auction. 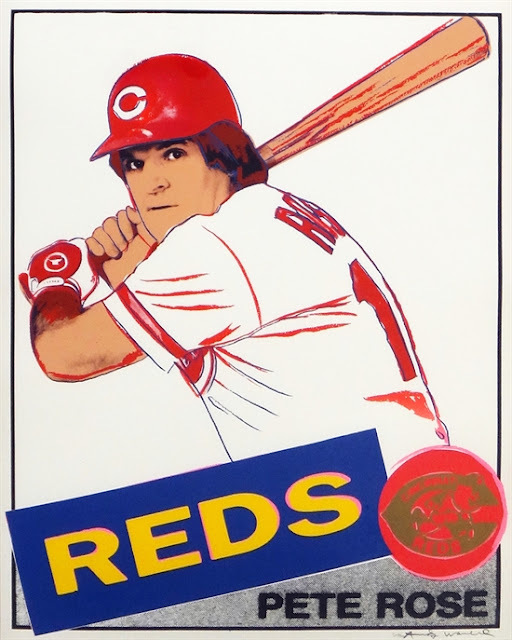 According to Artnet the test print is from the Cincinnati Art Museum, which is where the Warhol Pete Rose original resides. Artnet lists the estimate for the work at $15,000 - $20,000. This may seem high however less than a year ago the work was listed as $25,000 - $30,000. By those numbers the low estimate has dropped by 40% in 8 months. The auction for this unique piece of memorabilia ends on January 29 2019. For more information on the primary Warhol Pete Rose portrait click here. For an index of the Lavender and Test Print variations click here.